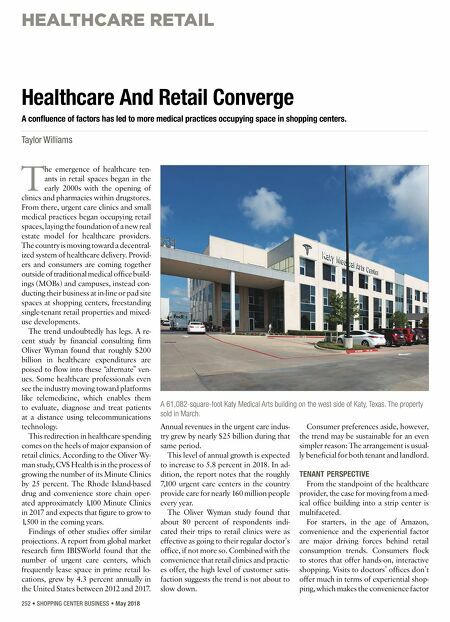 HEALTHCARE RETAIL 252 • SHOPPING CENTER BUSINESS • May 2018 T he emergence of healthcare ten- ants in retail spaces began in the early 2000s with the opening of clinics and pharmacies within drugstores. From there, urgent care clinics and small medical practices began occupying retail spaces, laying the foundation of a new real estate model for healthcare providers. The country is moving toward a decentral- ized system of healthcare delivery. Provid- ers and consumers are coming together outside of traditional medical office build- ings (MOBs) and campuses, instead con- ducting their business at in-line or pad site spaces at shopping centers, freestanding single-tenant retail properties and mixed- use developments. The trend undoubtedly has legs. A re- cent study by financial consulting firm Oliver Wyman found that roughly $200 billion in healthcare expenditures are poised to flow into these "alternate" ven- ues. Some healthcare professionals even see the industry moving toward platforms like telemedicine, which enables them to evaluate, diagnose and treat patients at a distance using telecommunications technology. This redirection in healthcare spending comes on the heels of major expansion of retail clinics. According to the Oliver Wy- man study, CVS Health is in the process of growing the number of its Minute Clinics by 25 percent. The Rhode Island-based drug and convenience store chain oper- ated approximately 1,100 Minute Clinics in 2017 and expects that figure to grow to 1,500 in the coming years. Findings of other studies offer similar projections. A report from global market research firm IBISWorld found that the number of urgent care centers, which frequently lease space in prime retail lo- cations, grew by 4.3 percent annually in the United States between 2012 and 2017. Annual revenues in the urgent care indus- try grew by nearly $25 billion during that same period. This level of annual growth is expected to increase to 5.8 percent in 2018. In ad- dition, the report notes that the roughly 7,100 urgent care centers in the country provide care for nearly 160 million people every year. The Oliver Wyman study found that about 80 percent of respondents indi- cated their trips to retail clinics were as effective as going to their regular doctor's office, if not more so. Combined with the convenience that retail clinics and practic- es offer, the high level of customer satis- faction suggests the trend is not about to slow down. Consumer preferences aside, however, the trend may be sustainable for an even simpler reason: The arrangement is usual- ly beneficial for both tenant and landlord. TENANT PERSPECTIVE From the standpoint of the healthcare provider, the case for moving from a med- ical office building into a strip center is multifaceted. 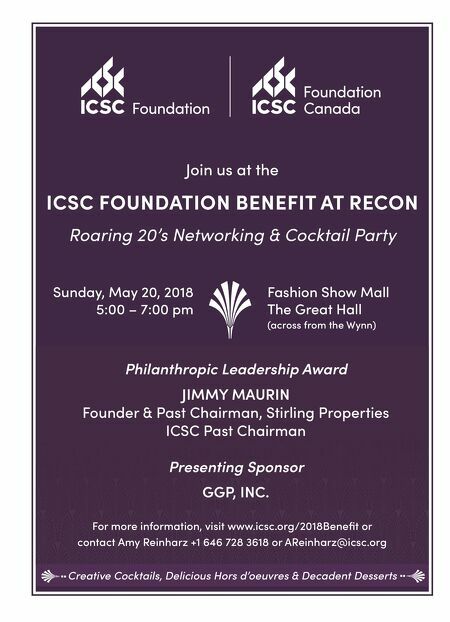 For starters, in the age of Amazon, convenience and the experiential factor are major driving forces behind retail consumption trends. Consumers flock to stores that offer hands-on, interactive shopping. Visits to doctors' offices don't offer much in terms of experiential shop- ping, which makes the convenience factor Healthcare And Retail Converge A confluence of factors has led to more medical practices occupying space in shopping centers. Taylor Williams A 61,082-square-foot Katy Medical Arts building on the west side of Katy, Texas. The property sold in March.